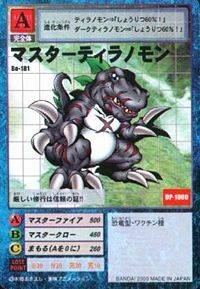 A Dinosaur Digimon that evolved from a Tyranomon that overcame many fierce battles. The scars covering its body act as proof of the numerous battles it has survived. It takes on a master-like role, coaching its Tyranomon followers and raising them to become full-fledged warriors. Its Special Move is razing the enemy with the high-temperature flames it breathes from its mouth (Master Fire). An evolution achieved only by Tyranomon that have overcome harsh training. 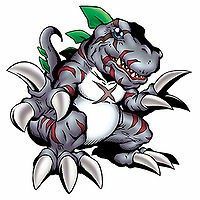 The Tyranomon around it refer to it as 'Master Tyrano' as a form of admiration. Title: ティラノ師匠 — "Master Tyrano"
n., A corruption of tyranno, from Tyrannosaurus Rex (「ティラノソーラスレックズ」 Tiranosōrasu Rekkuzu), one of the biggest carnivorous dinosaurs. | Shishou 「師匠」 means "master". Breathes powerful flames from its mouth. Slashes the enemy with its huge claws. Chou Kounetsu Touki  Super-heated Fighting Spirit 超高熱闘気 N/A Hyper Heat Blast Radiates a fiery heat wave from its body. Seishin Chūnyū  Spirit Infusion 精神注入 N/A Zen Recovery Returns its status or an ally's status to normal. Master Tyranomon appears as an unobtainable Digimon NPC in Digimon World. Master Tyranomon makes a brief appearance, in where after defeating Insekimon in the Speedy Time Zone and talking back to Tyranomon, where it'll refuse to join the Village of Beginnings until Master Tyranomon orders it to join the Village while it guards the entrance to the Ancient Dino Region. Master Tyranomon is a Level 完 (Perfect) Fire Digimon card. It has 50 POW, +20 P, 1280 HP, 850 Circle, 520 Triangle, 370 Cross with Versus Ice x3 effect. Its Support Effect allows to double user's Attack if its Specialty is Fire. 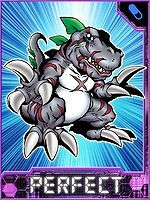 Master Tyranomon is an obtainable Digimon that evolves from Tyranomon with 8 or more DP or Greymon with 6-8 DP and can evolve to War Greymon regardless of its DP. Before Akira can enter File City, he must defeat Master Tyranomon, the city's gate-keeper, in a short, two-floor domain filled with dinosaur Digimon. Whenever Akira enters or leaves the city, he is greeted by Master Tyranomon. 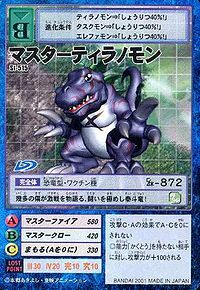 Master Tyranomon is a Level 完 (Perfect) Fire Digimon card that has the same traits as in Digimon World: Digital Card Battle. Master Tyranomon is the first required boss battle before Atsushi can battle against Seiryu Leader. 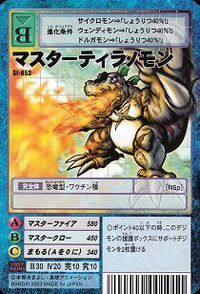 Master Tyranomon lives at the top of Tyrano Valley and has its signature technique, Master Fire. After it is defeated, it will give Atsushi the Old Claw. 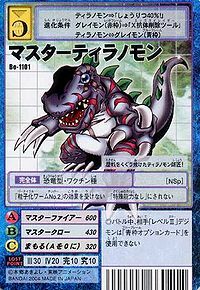 Master Tyranomon also made appearance as one of Qing Long Leader's Digimon, which can be challenged if Atsushi has all 6 Epic Weapons in his possession. 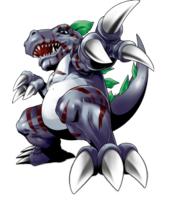 Master Tyranomon is available as a Digimon Medal. The countless scars on this battle-hardened authoritative dragon tell the stories of the wars it has fought! Its strict training is proof of its trust!! 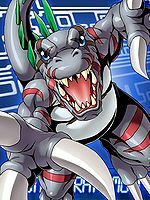 The Tyranomon Master has gone through a long history of combat!